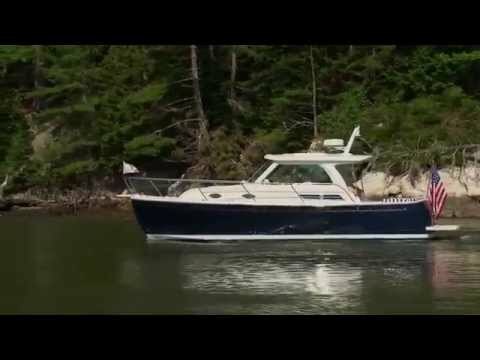 The Downeast boat is tightly associated with Maine’s proud boat building history, and the Back Cove 30 is a grand example of everything that takes the style beyond a simple boat and makes it a work of art. Built in Maine, her design is reminiscent of the working boats of her heritage and contains many of the same practical and elegant details. She has comfortable side decks and convenient handholds for security and efficient movement, and her traditional spoon bow and gently sloped transom result in a style that will turn heads in any harbor. The Back Cove 30 has a resin infused, deep-vee hull with propeller recess and standard trim tabs which result in a quiet and comfortable ride. With her standard 320 horsepower six-cylinder diesel, she will cruise at 20 knots and top out at 25. With the added power of the optional engine, she will cruise at 25 knots. Precision maneuverability provided by a standard bow thruster provides confidence at the dock. Below decks, her comfortable V-berth and head unit with pull-out shower faucet make overnighting on board a dream. Clear anodized aluminum windows w/ opening windows port, starboard and center.